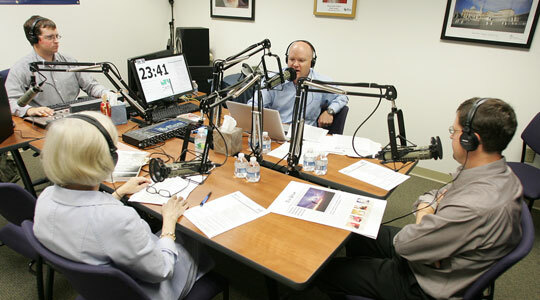 Summary of today’s show: Scot and Susan talk with Fr. Roger and Greg about the news of the week including the arrival of the new vicar general, Msgr. Robert Deeley; the societal costs of the casino bill proposed by Beacon Hill; singing the new Mass translation; a new religious order for Boston; and controversy over a new policy for altar girls in Phoenix. 1st segment: Scot welcomed everyone to the show and said to Susan that September 1 snuck up on his this year. Susan said she was sad to see August go. August is the shortest month of the year and February is the longest. Scot said at the Pastoral Center the last week of August is usually slow, but this summer he’s been involved in the Catechetical Certificate of the Theological Institute for the New Evangelization, there’s been various events saying goodbye to Fr. Rich Erikson, the outgoing vicar general, and events welcoming Msgr. Robert Deeley as the new vicar general. Susan said she was moved by the ceremony in which Msgr. Deeley took the Oath of Fidelity and the Profession of Faith, two rituals of the Church for those who hold certain offices in the Church. Scot welcomed Fr. Roger Landry and Gregory Tracy to the show. He asked Greg about his experience of the ceremony. Msgr. Deeley had talked about how when he went to theVatican he had three minutes to read all these documents in Latin before signing them, but in this instance he preferred the time to do it right and involve everyone in the Pastoral Center. Fr. Roger said transitional deacons and priests take the oath and profession, as well as pastors and other major responsibilities in the Church. The Church wants to make sure that the person is going to hand on the teaching of the Church, but also to reassure him that he will receive supernatural grace to live up to the demands of the oath and profession. These past years of work in Rome have given me a unique opportunity to be near His Holiness, Pope Benedict XVI. I could not help but note that, whatever the difficulty he encounters, or the problem that arises, he is always confident in the grace of Christ. The word that most captures the spirit of Benedict XVI is “joy”. He teaches us to place our hope in Jesus Christ, who is our joy, as well as the truth of our lives. Accepting this call is fundamental to our mission as Church. We need to come to know that grace ourselves and then, in accord with the call of our Baptism, to share it with others. As I begin this new assignment I ask for your prayers, and promise a remembrance in mine. Together may we bring the joy of Christ’s love to our corner of the world here in the Church in Boston. May Mary, Mother of the Church, Our Lady of Hope, intercede for God’s abundant blessings on our Archdiocese. Scot said it was very clear how closely Msgr. Deeley has worked with Pope Benedict and how well he knows him. Susan said joy is not just a silly feeling, but it is a gift of God. 2nd segment: In both the Anchor and Pilot there is an article called “Fierce response to Beacon Hill leadership’s deal on Casino bill.” Scot ran down the details of the new bill put up on August 23. While they project $400 million in tax revenue, the Mass. Catholic Conference says that won’t outweigh the social costs. Greg said people often ask how the Church can oppose casino gambling while allowing parish bingo. He points out that the Church says small-stakes gambling can be a legitimate form of recreation, while casino gambling often preys on the poor and those most unable to afford. In order for there to be $400 million in tax revenue, people have to lose more than $1 billion. These won’t be high-roller casinos like those in Monte Carlo and Las Vegas. This will attract those least able to afford to lose. Slot machines are particularly pernicious because while each individual play is only a quarter or a dollar, they can become addictive. Scot quotes the story which says that studies show how five years after a casino opens, the neighborhood sees a radical increase in crime and addition to gambling doubles within a 50-mile radius. With the three new proposed casinos, nearly every part of the state would be within 50 miles of the casino. Susan pointed out that even if we poured every dime in tax revenue into schools and the like, the ends don’t justify the means. She noted that casinos aren’t built in wealthy suburbs, but in our poorer areas. Scot said you don’t have to be Catholic to know that this isn’t a good idea. Who’s going to be paying for the societal ills? How much would we pay to decrease crimes by the same amounts they are going to rise? Fr. Roger wrote an editorial on this issue a year ago. He said he thinks along the same lines. This gamble on casinos is a terrible bet. You can’t make a living off going to a place where the house always wins. The state is gambling its future on the backs of slot parlors and casinos. We have to stand up in our Commonwealth and say that this is a bad bet in which we’ll lose more than we win over the long term. Stop Predatory Gambling, the Mass. Family Institute and United to Stop the Slots are other organizations involved in opposing this bill.They encourage people to call the Governor’s office and elected representatives and tell them that this is a reckless gamble for Massachusetts. 3rd segment: Scot noted that we’ve talked about the coming launch of the new Roman Missal on the first Sunday of Advent, but starting this weekend at the the option of the pastor, parishes can start singing certain parts of the Mass in the new translation. Fr. Roger said the parts of the Mass we typically sing have new translations, including the Gloria; the Holy, Holy, Holy; and the Creed. The US Bishops said bishops could authorize their pastors to introduce the sung Mass parts in the beginning of September to help people get ready for the changes coming in Advent. They realize that in Advent we don’t sing many of these parts so they wanted to give three months of practice so that on Christmas morning the Gloria will be done in the most beautiful way possible. Susan said she loves the title of the editorial: “Singing the Mass.” We sing the Mass, not just sing at Mass. Scot said Fr. Jonathan Gaspar will be with us on Tuesday to talk about the new Mass translations. He said in Fr. Roger’s editorial he refers to the Vatican II document Musicam Sacram which differentiates three different levels of music in the Mass and we’ve inverted the priority of the different kinds of music at Mass. The first priority for singing are the dialogue parts between the priest and the people: the Sign of the Cross, for example. The other Mass parts of the second priority: the Kyrie, Gloria, Lamb of God, the Creed, and Prayer of the Faithful. Of lowest priority are the entrance, offertory, and communion hymns as well as the Psalm, the Alleulia, and the readings. 4th segment: Scot said Cardinal Sean in recent months has been working to help form three diocesan religious orders. This week the Pilot profiles the Ambassadors of Peace. It was founded by Fr. Michael Sevigny, a Capuchin Franciscan for over 40 years. It will be a contemplative and active community helping member in a quest for inner peace and to bring peace to the world. The community will be based in Weymouth at a former convent at Immaculate Conception in Weymouth. the other two order are the Daughters of Mary of Nazareth led by Sister Olga Yaqob and the Franciscan Tertiary Handmaids of the Immaculate. He said the Lord raises up new orders when the Church particularly needs them and they have specific charisms for the needs of the day. On September 16-18, the Apostles will be holding a discernment weekend for women, and seven of the eight spots are filled already. Fr. Roger often leads retreats for new religious communities. They often succeed with God giving a particular charism to the founder or foundress, but there’s also a real sense of communal love among the members. They also need very good formation with a very clear path to holiness that involves fraternal correction and real education in the faith. Moving to a new story, the rector of the Cathedral in Phoenix has changed his policy on altar servers so that only boys would be altar servers, while the girls would be trained as sacristans. The story has received a lot of coverage in the Catholic blogosphere. The rector said the issue can’t be approached from just and emotional standpoint, but serving at the altar is not a right. He wants both boys and girls to be involved in service, but he’s found that when there are altar girls, there’s often not any altar boys. Greg said he agrees with his assessment that when young girls are involved in something, the young boys choose not to be involved. He’s also seen that girls of that age are more comfortable being in front of people, while boys are not. It’s also valuable to have the boys brought closer to the liturgy because it does engender more vocations to the priesthood. It’s not about power or whether girls are valuable. It’s just a matter of formation. Susan says she’s a traditionalist in such things, but she’s not sure whether it’s true that having girls as servers is itself a reason for more boys not being servers. She’s also not sure whether being a server ultimately makes a difference for whether boys become priests. Fr. Roger’s parish has both boys and girls. To preserve a balance, he actively recruits boys and about two-thirds of his servers are boys, which makes it easier for boys to come. When there’s a super-majority are girls, it becomes a girl thing to do. If the real urgency in the Church is for priestly vocations, then we need to have a small seminary within the parish. 70% of priests today were altar servers when they were younger.